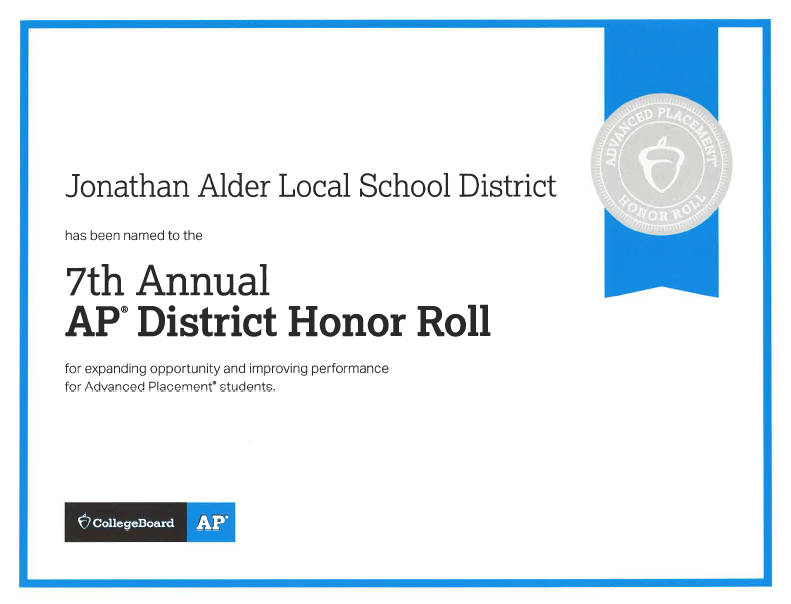 Jonathan Alder Local School District was named to the 7th Annual AP District Honor Roll. Only 433 districts across the country earned this distinction! To be included on the AP Honor Roll, districts simultaneously had to increase access to Advanced Placement coursework and maintain or increase the percentage of students earning scores of 3 or higher on AP Exams (scored 1-5). Honor Roll Districts defy the expectation that expanding access automatically results in a decline in the percentage of exams earning scores of 3 or better. This year's Honor Roll is based on Jonathan Alder's scores from 2014-2016. Congratulations to all of our students and faculty who contributed to this honor and recognition!